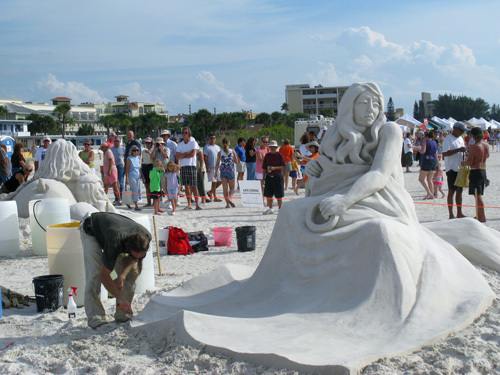 I attended a sand sculpture contest on Treasure Island Beach this past Saturday. 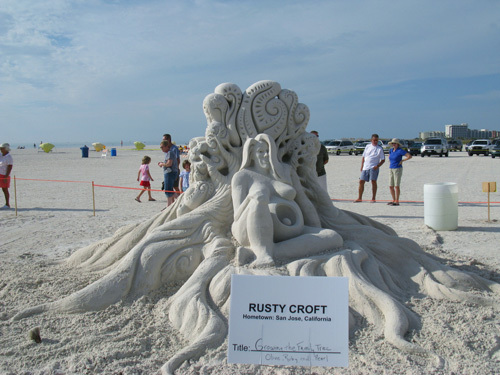 Named "Sanding Ovations" it pitted eight master sand sculptors in competition for the main prize of $3000. 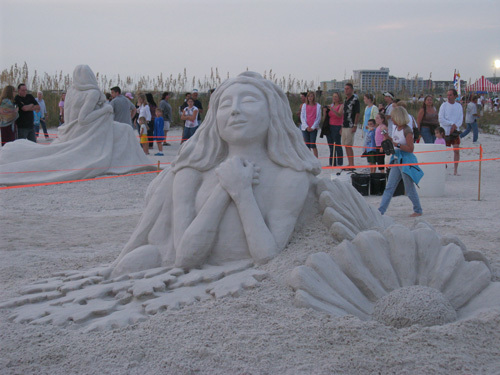 This sand art competition (and music festival) was put on by the City of Treasure Island, Florida in cooperation with the Treasure Island Chamber of Commerce. Starting On Friday, November 19, each artist was given 12 tons of pure white sand (trucked in from Davenport, FL), an 18'x18' space, and 24 hours (spread over 3 days) to create a sand sculpture worthy of the blue ribbon. It looked successful right from gate. When we got there about 2:00pm on Saturday, November 20, it seemed like every resident from Treasure Island was down there, along with one or two friends. 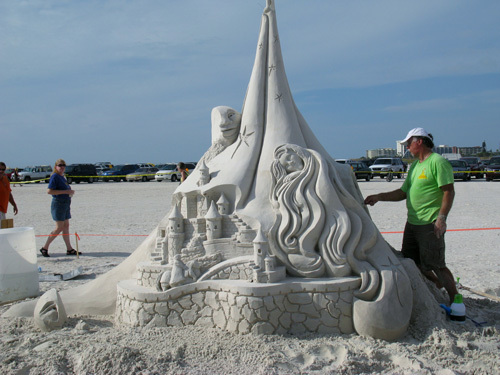 The judges were actually the professional sand sculptors, themselves. The favorite was local artist, Dan Doubleday...and he didn't disappoint as he walked away with 1st Prize for his piece, "The Folly of Life." Karen Fralich from Burlington, Canada placed 2nd with "Time Line", while Carl Jara of Cleveland, Ohio took 3rd with "Haunted." Actually, I was surprised that Lucinda Wierenga (South Padre Island, Texas) and Matt Long (Staten Island, NY) got shutout for their pieces "Sunset" and "Pieces of Dreams", respectively. 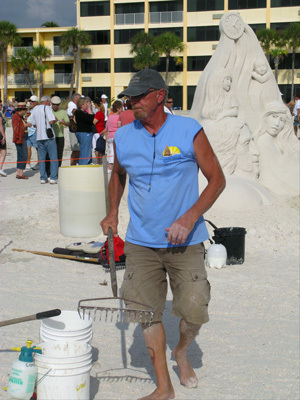 Brad Goll, Austin, Texas sand artist, captured the $500 prize for being the "People's Choice." His piece (Gollrilla) drew a huge crowd and was much photographed. 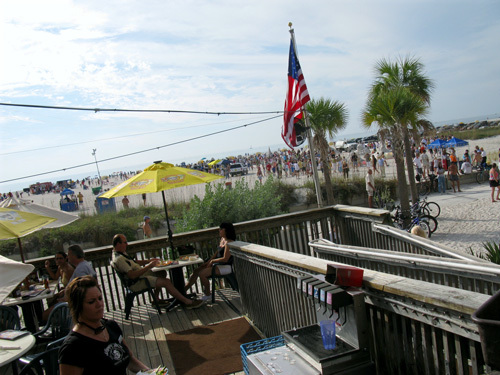 My first shot from Sloppy Joe's Beach Bar. No, this was not alcohol-related! I knew I was being jostled by the crowd behind me...but this is ridiculous. 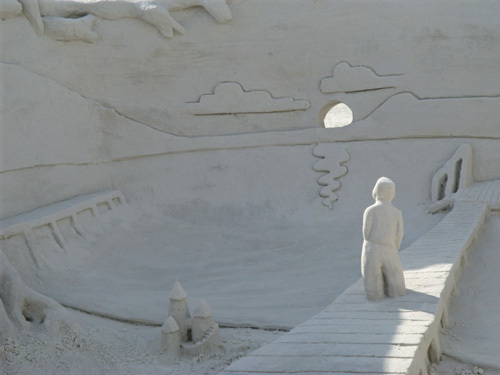 Joan Evans lives on Isle Of Palms, across the street, she said, "We've always enjoyed sand sculpture artists. It's nice that we can have something this close. I came down here, yesterday, when they were setting things up. Even though the artists were busy, they stopped to talk with me, and show me some of their tools. It's amazing what they can do with some normal garage-shop items." The centerpiece is called "The Sponsor's Sculpture." 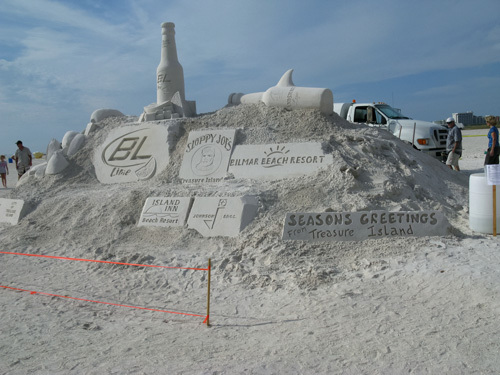 It was created by Sanding Ovations as a thank you to the major sponsors. It was not voted on, but lot of people wanted to get their picture taken in front of it. Katie Corning, from Ft. Myers, sculpted this beautiful piece called "Humility and Gratitude." Jeanne Fox, from Michigan, said, "This piece had so much feeling for me. It reminded me of a picture I took of my daughter when she was about 13. It made me tear up!" Carl Jara, working on his 3rd Place piece named, "Haunted." He won $1000. John Edwards, from Cincinnati OH, said, "You know, I watched him pattern that skirt. I even took an extended video of it as he did it...and I still cannot figure out how he made that so elegant." Rusty Croft's piece..."Growing the Family Tree." Mo Hatcher, from Canada, said, "The detail in this is just amazing. I watched him use a squirt bottle filled with water, and a stiff paint brush to do those tree roots. It was like a tutorial." Brad Goll's "Gollrilla" got a huge load of attention...and The People's Choice Prize of $500. 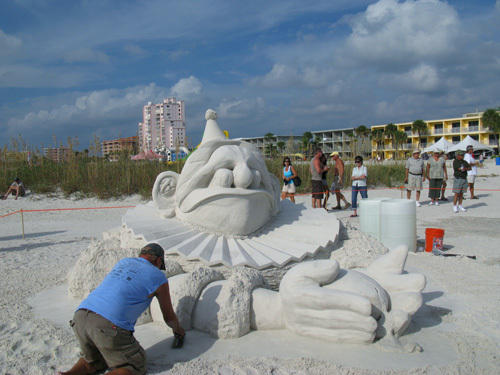 Sand sculpture contest winner, Dan Doubleday, from right here on Treasure Island Beach working on his piece, "The Folly of Life." It all paid off with a $3,000 1st Prize award. Ellen Frenche, from Long Island, said, "Oh my, this man worked hard. He was a ball of sweat, but he never took any shortcuts. He used a stiff little paint brush to do most of that. I've never seen anything quite like his workmanship. I told him I'd go get some water for him to drink. He got kind of embarrassed, and apologized for sweating so much. He said he had water in a cooler, but when he starts focusing on brushing, sometimes he forgets about everything else." One of the few times we got to see Dan Doubleday standing up. Usually, he was on his knees working hard to bring out the detail of his sculpture. Karen Fralich of Burlington, Canada, is the creator of this piece named, "Time Line." 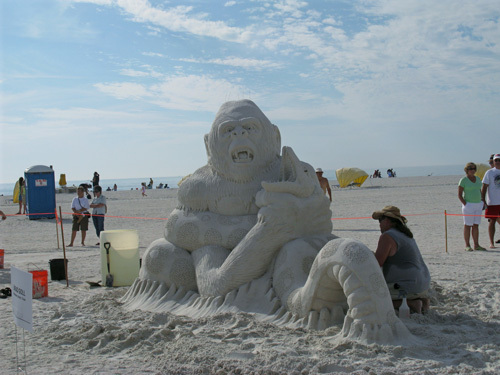 You can see why voting for winners in this sand sculpture contest would be so difficult. She took 2nd Place and a prize of $2,000. I really liked this piece by Matt Long called "Pieces of Dreams." It appeared to be a spoof on Humpty-Dumpty. If you look on the ground to the far left, you gan see the other half of Humpty-Dumpty's head. This guy had great detail. Checkout the shot below. Debbie Ecklestein, another snowbird from Ohio said, "I liked this one the best of all of them. It surprised me that he was not one of the winners. The detail in his sand sculpture is just so remarkable. Look how intricate those little steps are. Plus. look at the grout between the rocks on the supporting walls. That took a lot of time. 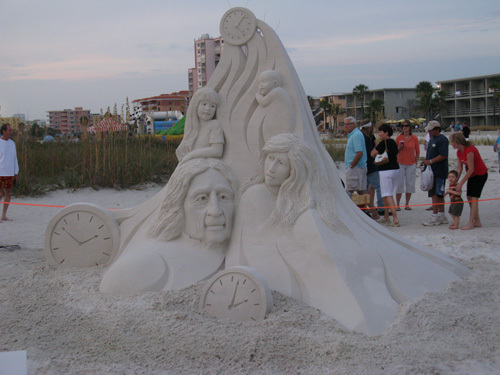 I really thought this piece would win the sand sculpture contest." Matt Long's attention to detail is incredible. How he created this little horse and rider with a squirt-bottle of water and a few dry paint brushes is beyond me. 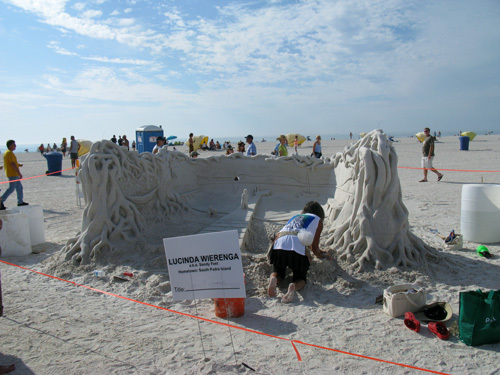 Lucinda Wierenga, from South Padre Island, Texas was another sand artist whose acute attention to detail drew my attention. The picture below just amazes me. Her piece, "Sunset" really tells a story. I cannot imagine the concentration it took to create this small scene. I wished I could have seen how she started at the front wall and worked her way back. To me, Lucinda Wierenga deserved to place in this competition. 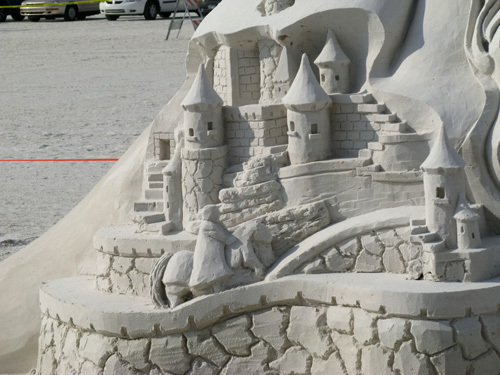 The Treasure Island sand sculpture contest was a well-planned event. The city and Chamber of Commerce did a great job. There were plenty of tents for food and drink, and live music started each afternoon before the sun went down. if you get the chance next year, plan to attend as part of your Florida beach vacation. You will really enjoy it. 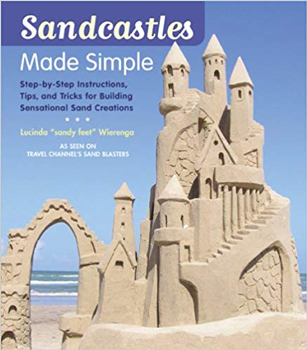 Now you too can learn how to create intricate sand castles. Written by contestant, Lucinda Wierenga, you will be amazed at some of the simple tips to make you look like a pro.